Marines will stay warm during ambient cold weather operations with new boots and socks. 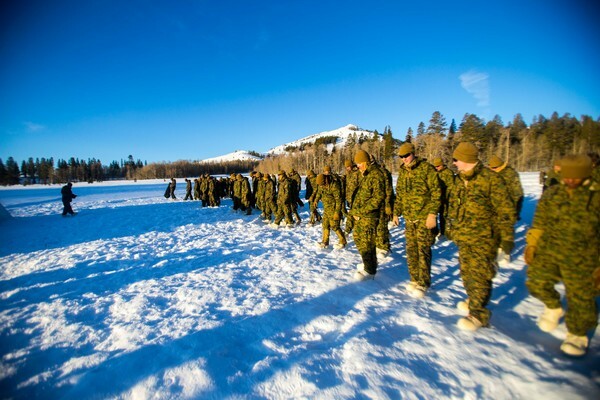 Marine Corps Systems Command intends to award sole source purchase orders for two types of Intense Cold Weather Boots and Intense Cold Weather Socks to improve Marines’ performance in cold weather environments. A total of 2,000 boots and 50,000 pairs of socks will be delivered from four vendors by Sept. 28. “Based on market research, industry days and events such as Modern Day Marine, we narrowed our decision for the orders down to two companies for cold weather boots and two for socks,” said Todd Towles, program analyst for the Clothing and Equipment Team at MCSC. There are currently no Marine Corps issue boots designed for use in the -20 to 20 degrees Fahrenheit range. The Temperate Weather Marine Corps Combat Boot was designed for a temperature range between 20 to 60 degrees Fahrenheit, and the Extreme Cold Weather Vapor Barrier Boot was designed for a range between -65 to -20 degrees Fahrenheit. This effort to acquire the cold weather boots and socks will help MCSC evaluate commercial off-the-shelf solutions and offer the potential to reduce or eliminate the current environmental protection gap, said Towles. The socks will have much higher wool content than the polypropylene wool socks Marines currently use. Additionally, the Clothing and Equipment Team is hopeful the new gear will offer increased water repellency, comfort and insulation in extreme cold weather environments. MCSC’s Program Manager Infantry Combat Equipment will conduct a field user evaluation December 2018 through March 2019. The team will gather input from Marines as they wear the ICWB and ICWS prototypes at the Mountain Warfare Training Center, Fort McCoy and Norway. Feedback regarding fit, form and function will be collected along with how well both prototypes of the ICWB and ICWS perform in sub-zero temperatures. The Clothing and Equipment Team falls under Program Manager Infantry Combat Equipment at MCSC.